How often do we put our ears to work in a game? We're often so focused on visual stimulation that the audio takes a backseat. But an intriguing new title is coming that asks us to listen. Listen carefully, or be trapped in a time loop forever. 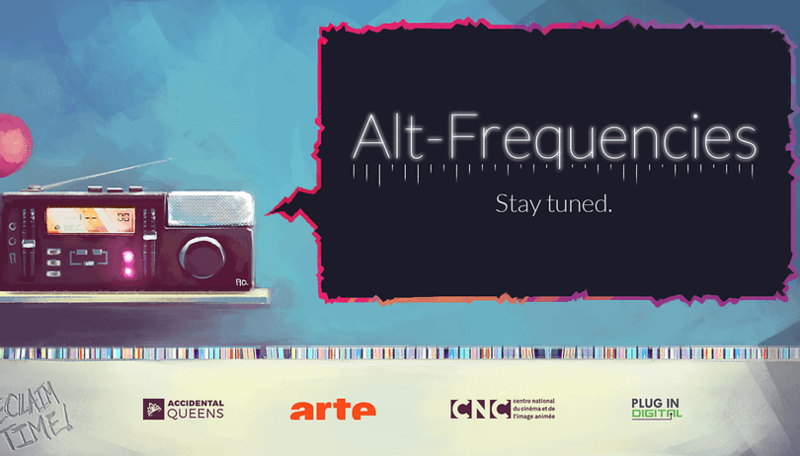 Alt-Frequencies is an upcoming game from Accidental Queens, the developers behind A Normal Lost Phone, a game that won critical acclaim by presenting a compelling human story through the novel concept of poking around in a stranger's phone. Once again, we have a narrative that unfolds through an unusual mechanic - this time, through listening to and disrupting different radio stations. We had a chance to try out a demo at Berlin's A Maze festival for experimental games, and donned the headphones to fight for justice. The narrative of Alt-Frequencies centers around a Groundhog Day-style time loop, which has condemned society to re-live the same slice of time over and over again. The worst part? Somehow, we all voted for it. But you have the power to liberate humanity via the magic of...radio? In the age of YouTube and podcasts, radio may seem a little dated but Alt-Frequencies portrays the medium with an effective combination of affectionate parody and pointed skewering of the way mass-media tries to manipulate us. The player can tune into to different radio stations offering very different perspectives and personalities - for example, conspiracy theorist pirate radio, a conservative talk radio station, rebellious student activists, politicians and even a dog. But merely being a passive listener won't get you anywhere, as eventually the time loop will set in and you start all over again. Instead, you have the power to record sections of what you hear and then play back your recordings to interrupt the broadcasts on other stations, causing the hosts to react in different ways and changing the timeline. The interface is simple with only a few buttons on screen at any time, but there are also gesture-based controls implemented that are designed to make the game more accessible to the visually impaired. Given that the overwhelming majority of games (as in 'video' games) rely on graphics as the primary appeal, this is a welcome consideration for the blind. The main appeal of the game lies in the high-quality writing and voice acting, which deliver convincing personalities in the radio hosts and callers that will be recognizable archetypes to many - after some puzzling you'll get to know these characters and what kind of information they respond to, what kind potentially offends them, and how your actions are affecting their lives. My time with the demo of the game's second chapter left me hungry to know more about these NPCs, and as you learn how to manipulate them and spread rebellion, the game's theme of questioning our relationship to mass media comes to the fore. Alt-Frequencies is being made in collaboration with ARTE, the European media company that has had a hand in previous mobile games that offer something more on the cerebral side with cultural commentary, such as Homo Machina and Vandals. While my time with the demo was too short to really get to know just how deep the game goes with this, it's certainly more satisfying than the many mobile games out there that focus on simple addiction. I can certainly see Alt-Frequencies as a great interactive alternative to listening to podcasts or music on the go, although the game is also releasing on Steam as well as Android and iOS if you prefer to play on desktop. The game is set to release in May, and we look forward to bringing you a more complete verdict on this radio-jamming time-twister closer to the date.